SPSS LAG Function – What and Why? You are here: Home SPSS Glossary Glossary SPSS LAG Function – What and Why? In SPSS, LAG is a function that returns the value of a previous case. It's mostly used on data with multiple rows of data per respondent. Here it comes in handy for calculating cumulative sums or counts. The most basic way to use LAG is COMPUTE V1 = LAG(V2). This simply computes a (possibly new) variable V1 holding the value of the previous case on V2. This is illustrated by the first screenshot. It's the result of running the syntax below. Since the first case doesn't have a previous case, it has a system missing value on the new variable. data list free / id. *2. Find id value of previous case. A great way to illustrate how LAG works is to create a counter variable. 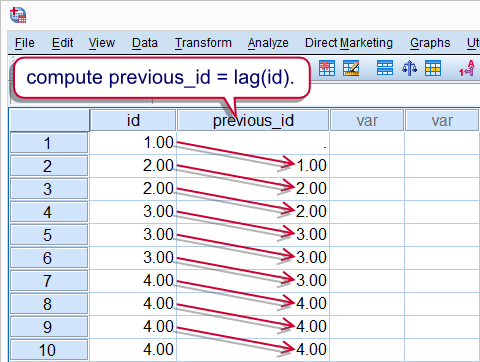 For each id value we'll create a variable that indicates its nth row of data. We'll start by identifying the first record of each id by using an IF command as shown in the syntax below. How it works is illustrated by the screenshot. 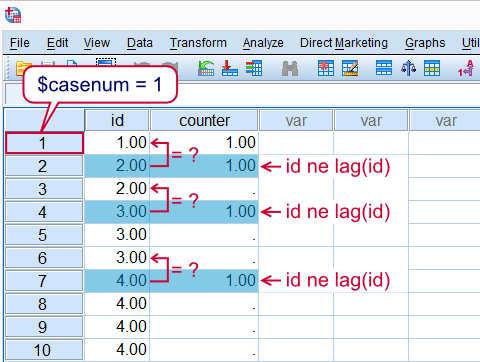 *For every first row per id, counter = 1.
if $casenum = 1 or id ne lag(id) counter = 1. Next we'll finish our counter. What's important to understand here is that cases are processed sequentially from top to bottom when SPSS executes data transformations. That is, SPSS will start at $casenum = 1 and work its way down case by case. So a value created by LAG during this process may be used by the next case. The screenshot below illustrates three of the steps that occur while SPSS processes the syntax below.Since these steps usually require milliseconds to complete you don't actually see them occurring in normal situations. *2. 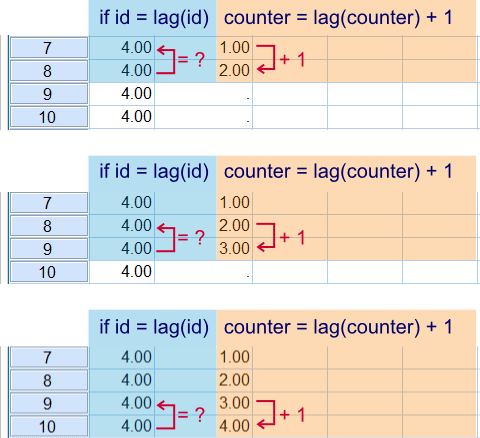 For every subsequent row, increase counter by 1.
if sysmis(counter) counter = lag(counter) + 1. SPSS Long Data Format. Note how each customer can have one or more records. How often do customers place an order? Or alternatively, how many days pass between orders by one customer? How many orders does the average customer place? How much money do customers spend? We'll walk through these questions using the LAG function for answering them. Running the syntax below will create the data from the previous screenshot and find the days between orders by one customer. Note that the records must first be sorted in a meaningful way. Next, if customer_id = lag(customer_id) checks whether each record is not the first record for a given customer. Only for these records days_between_orders will be calculated. data list free / order_id (f2.0) order_date(edate10) customer_id invoice_amount (2f3.0). *2. Sort records by customer_id and then order_date. *3. Compute days between orders by single customer. if customer_id = lag(customer_id) days_between_orders = datediff(order_date,lag(order_date),'days'). Now we'll create a cumulative order count per customer. We'll first set this new variable to 1 for each customer's first record. This is selected by if $casenum = 1 or lag(customer_id) ne customer_id. Next, we'll add 1 to it for each consecutive record if it belongs to the same customer. This condition is implied by if customer_id = lag(customer_id) Note that we make use of the fact that SUM(SYSTEM MISSING,X) = X. We can't use the + operator here because SYSTEM MISSING + X = SYSTEM MISSING. *1. For first record per customer_id, cumulative_orders = 1.
if $casenum = 1 or lag(customer_id) ne customer_id cumulative_orders = 1. *2. For each consecutive record, add 1 to cumulative_orders. if customer_id = lag(customer_id) cumulative_orders = sum(lag(cumulative_orders),1). Finally we'll create the cumulative expenditure. This works quite similarly to the previous example. Instead of adding 1 to each consecutive record, we now add invoice_amount. *1. For first record per customer_id, cumulative_amount = invoice_amount. if $casenum = 1 or lag(customer_id) ne customer_id cumulative_amount = invoice_amount. *2. Cumulative amount for second through nth records. if customer_id = lag(customer_id) cumulative_amount = sum(invoice_amount,lag(cumulative_amount)). As a rule of thumb, always run EXECUTE immediately after commands using LAG. This is one of the very few cases where you really need to run EXECUTE or a procedure.The reason for this is rather technical but for those who wonder: LAG is always carried out after all other transformations. This means that the order in which commands are executed may deviate from the order in which they're specified. So if a variable affected by LAG is used in a subsequent command, the latter is likely to use the ‘wrong’ values because LAG hasn't taken place yet. In order to get the value of the nth previous case, use LAG(...,n). Note that n must be a positive integer. That is, you can't use LAG(v1,-1) for getting the value from the next instead of the previous case. LAG can't readily access values from next rather than previous cases. If you do need the value of a next case, one option is to reverse the order of the cases and use LAG anyway. You can also get values from next cases with CREATE or SHIFT VALUES. Note that these are procedures (and not functions). This means you can't use them in an IF command for evaluating conditions like we did in most of the examples discussed in this tutorial. Shortly after writing this tutorial we received some more challenging questions that are solved by using mainly LAG and IF statements. We'll walk through them below. The syntax below focuses on explaining how things work, step by step. It's not the fastest option for answering the question.For one way to shorten it, see Compute A = B = C.
data list free / sequence id picture. variable labels id 'Respondent id'. *.2 Session = 1 for every respondent's first row of data. if $casenum eq 1 or id ne lag(id) session = 1. *3. Detect switches (different picture for same respondent). if $casenum gt 1 and id eq lag(id) and picture ne lag(picture) switch = 1. *4. Increase session with 1 for every switch. if $casenum ne 1 and id eq lag(id) session = sum(lag(session),switch). Note the use of AGGREGATE in step 6. As with the previous example, this syntax could be shortened. data list free / household_member household vote. *2. Sort by household, then vote. sort cases by household vote. *3. For first member of household, counter = 1.
if $casenum = 1 or household ne lag(household) counter = 1. *4. Identify switches (vote changes within household). if $casenum ne 1 and household = lag(household) and vote ne lag(vote) switch = 1. *5. Increase counter by 1 for every switch. if $casenum ne 1 and household = lag(household) counter = sum(lag(counter),switch). *6. Different votes in household = max(counter). *7. Optionally delete temp helper variables. Hi Carolyn, thanks for the compliment! this tutorial saved me lots of time! I am a rookie syntax writer, but this rocked! if(pid = lag(pid)) Previous_VarXY = lag(VarXY). SHIFT VALUES VARIABLE=VarXY RESULT=Previous_VarXY LAG=1.